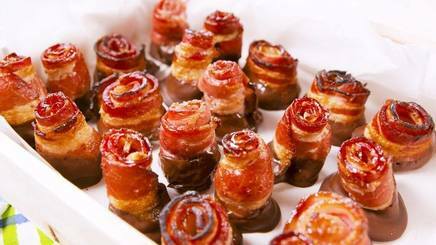 Bacon & Chocolate is an amazing combination...but you can take it up a notch with the Bacon Chocolate Roses! Make them from scratch, or take a shortcut and start with these Bacon rosettes: https://www.baconaddicts.com/products/bacon-roses-bacon-rose-bites-dozen-12ct and just dip them in chocolate! Perfect for any special occasion! !